However, on this occasion, it was only my brother and I who went to see her, so we thought we’d take her out to lunch in Cabot Circus. 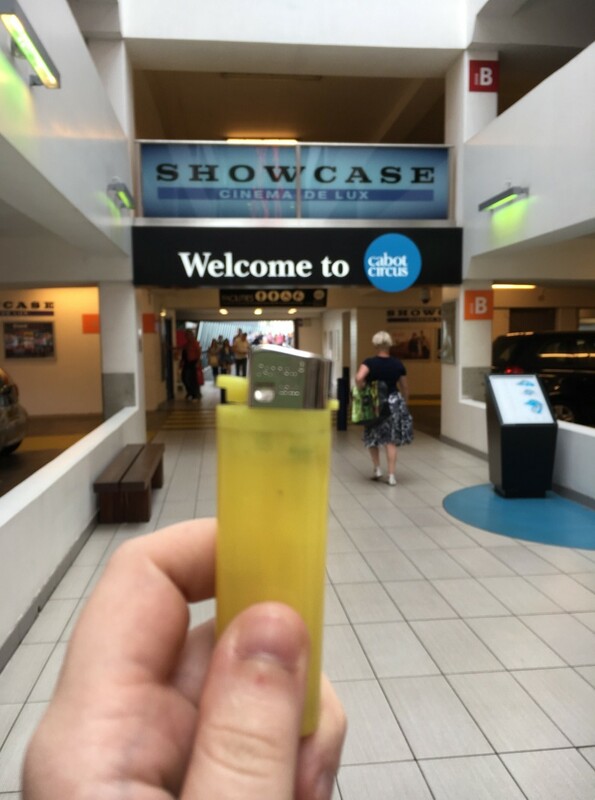 It was a particularly grey day (even though it had been forecast to be beautifully sunny) so we had donned shorts and T-shirts, only to find the weather depressing, so my first port-of-call was to pick up a lighter that reflected how the weather should have been. Linked arm-in-arm and shivering slightly, we faced a known adversary as we made our way out of the car park and towards the mall. In order to get from one to the other, we had to use a pedestrian bridge that goes over the busy roads between the two buildings. How can a bridge be an adversary, I hear you ask. Well, allow me to explain. For whatever reason – I assume an artistic architectural style – the bridge is made to seem warped and sloped, as if you’re traveling through the world’s dullest rollercoaster ride on foot. I imagine that most people wouldn’t give it a second thought, but my Nan tends to find it rather disorientating as it makes her veer off to different sides of the walkway as she tries to right her balance. Nevertheless, not one to be deterred so easily (she did live through the Bristol bombings), she persevered and we made it to the other side unscathed. Cabot is pretty much your bog-standard shopping mall, full of chain restaurants, pricy clothing shops and people… lots and lots of people. * I don’t tend to be bothered by crowds, but as I stated earlier, Nan’s getting on a bit and doesn’t move as quickly as the rest of the swarming locusts that are weekend shoppers. Most are perfectly fine human beings, but there are always those few that fly past or tut when they get stuck behind the slow-moving old lady. For this reason, I found myself feeling an urge of protectiveness for my Nan, as well as a slight hostility towards the scantily-clad pre-teens who would nudge past us on their way to Primark. We decided to go for a safe bet for food, and feeling pretty famished, we made our way to Zizzi’s. After a short wait, we sat down for a three-course meal. The staff seemed pretty swamped, but our waitress was a delight, which is always nice. If I’m honest, we probably could have (and should have) stopped after the main course, but I couldn’t resist the idea of a sweet-dough calzone, stuffed with banana and chocolate, served with vanilla gelato and salted caramel sauce… honestly, in my position, could you? I wish I’d snapped a picture of it but the thought at the forefront of my mind was to eat it, not to pretend it was Kate Moss as some of these foody Instagram spammers do. Once desert had thoroughly beaten the buttons off our trousers, we left in search of new clothes for my brother. After wandering aimlessly through House of Fraser (and me picking random things for my brother to model), the half-hour had only yielded three items, so we gave in and admitted defeat, promptly paying for the items and trying to make our way to the exit. I say trying because it turned out one of the escalators was broken, meaning the queue for the tiny elevator was sizable enough that we thought finding stairs would be a quicker task. On the third lap of the store, we’d found that there weren’t any stairs to the upper floors and hung our heads in shame as we went to the back of the queue for the elevator. Once we finally made it out, we faced the demon bridge once again and headed for home, stuffed to an uncomfortable degree but with smiles on our faces. *The place seems pretty empty in all the pictures, but that was because I took them as the shops were closing, so I could actually get some of the building in the shot instead of passers-by.